Earlier this year, Brazil broke new ground by releasing ten draft dietary guidelines which warned against processed foods and even addressed deceptive marketing by the food industry. This week, the nation released its final version. The guidelines are, of course, written in Portuguese, but New York University professor Dr. Marion Nestle translated them into English. Our dietary guidelines are apolitical, vague, and meek, by comparison. They read: “Prevent and/or reduce overweight and obesity through improved eating and physical activity behaviors,” “maintain appropriate calorie balance during each stage of life – childhood, adolescence, adulthood, pregnancy and breastfeeding, and older age,” “increase vegetable and fruit intake.” Let’s hope next year’s update takes some cues from Brazil. Read more about Brazil’s new guidelines in this story we ran in March, shortly after they were announced. Earlier this month, Buenos Aires mayor Mauricio Macri announced that fruit vending machines will soon be installed at the 35 wellness centers that have opened throughout the country’s capital since June of 2012. These wellness centers–located in various parks and train stations–have doctors, nurses and nutritionists on staff, and provide people with a chance to have their weight, height, blood pressure, and blood sugar checked at no cost. Free nutrition counseling is also available, and some offer free yoga classes and walking groups. As of January 2014, half a million Buenos Aires residents took advantage of this public service. And, soon enough, they’ll also be able to buy a piece of fruit on their way out, if they so choose. It sure is nice to see real food offered, as opposed to “healthwashed” processed offerings like baked chips, cookies with a dusting of whole grains, and diet sodas. Much to the disappointment of many large food producers, Chile has a new front-of-package labeling system that specifically points out what food and beverage products surpass government-established limits for calories, sugar, sodium, and saturated fat (via this black “excess of…” label on the front of packages). What’s more, any product that is too high in any of those categories may not be sold in schools, and it is forbidden to target ads for said products to children under the age of 14. There are some valid criticisms to this approach (mainly that by focusing on very specific nutrients “of concern,” food companies can technically reformulate minimally nutritious, highly-processed products in a way that manage to meet criteria without making them truly healthy). But this is nevertheless an important effort, as it is a front-of-package labeling scheme meant to deter the purchase of certain products. August 29, 2014, was the deadline for 375 large and medium-sized companies to label the amounts of salt, fat, and sugar on their processed foods’ packaging. Labeling consists of a traffic light: red for products high in these values; yellow for medium values, and green for low values. Smaller companies have until November 29, 2014, to meet this new requirement. Industry has long feared traffic light labeling and battled it globally for years with very expensive lobbying campaigns (no company wants its products to carry multiple red lights), so this is certainly a win for public health. The fact that all fat is lumped together is slightly problematic–imagine baked Cheetos getting a green light, while walnuts get a red light!–but at least this means that healthwashed items like children’s cereals with added corn dust for fiber will be called out for their high sugar content. This image shows a pack of marshmallows available at an Ecuadorian supermarket, with both the traffic light labeling system (“high in sugar,” “low in fat”) as well as a “contains GMOs” (“contiene transgenicos”) label. Ecuador is one of 64 countries that has mandatory labeling of GMOs. Although domestically we now have a soda tax in Berkeley, CA (proposition E in San Francisco received 54.5 percent of the vote but not the 66.67 percent required to pass), our neighbor to the South passed a nationwide soda tax at the beginning of this year. It was an especially meaningful victory for public health advocates considering that Mexico is the world’s top consumer of soda (on average each person drinks 43 gallons per year), and that Coca-Cola aggressively forced its classic soft drink onto the native population of Chiapas. 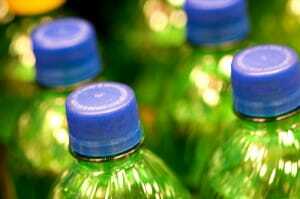 A separate study conducted earlier this year by Mexico’s National Institute of Public Health measured the decline in sugary beverage consumption at 10 percent during the first three months of 2014, compared with the same period last year. That study also reported a 7 percent rise in purchases of beverages that aren’t subject to the new tax, such as plain bottled water and milk. When it comes to food policy, the United States should consider looking to “developing nations” for well-developed strategies.